Why has philosophy evolved in the way that it has? How have its sub-disciplines developed and what impact has this development exerted on the way the subject is now practised? Each volume of The Evolution of Modern Philosophy will focus on a particular sub-discipline of philosophy and examine how it has evolved into the subject as we now understand it. The volumes will be written from the perspective of a current practitioner in contemporary philosophy, whose point of departure will be the question: how did we get from there to here? 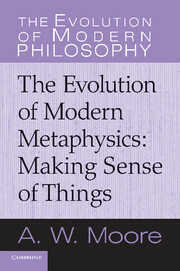 Cumulatively the series will constitute a library of modern conceptions of philosophy and will reveal how philosophy does not in fact comprise a set of timeless questions but has rather been shaped by broader intellectual and scientific developments to produce particular fields of inquiry addressing particular issues.